Entergently: Kozy has a new mascot! Kozy has a new mascot! OK so I know I have been MIA all week, but for good reason. Well first of all I have been a bit under the weather, then we went to Hershey Park on Sat. We had so much fun!! (Ever was just tonight talking about the Truck Roller coaster that he wants to ride again). But I think my immune system took a hit that day. No wonder, I mean I was fighting a slight cold and then I go and walk for 11 hrs, wearing a baby the whole time, chasing kids around, and shocking my system on some pretty rockin coasters!!! (LOVE roller coasters!!). It is no wonder that I woke up on Sunday morning (OK it was around noon, LOL) feeling like crap! But alas, that evening we still managed to make it out to pick up our new family member. This is Ptolemy (pronounced tall-a-me). Well that is what we named him, (though Xian often calls him Tallster). His registered name is OJ Recap. He is a retired racing Greyhound and is 3 ½ yrs old and 75lbs. and has massive muscles . . . that apparently he will lose with time (though he should put on a bit more weight too). We have been without a dog for over 2 yrs, which felt so weird. We got our first dog just months after getting married. I had researched Great Danes for a long time before getting Andromeda. She was gorgeous. 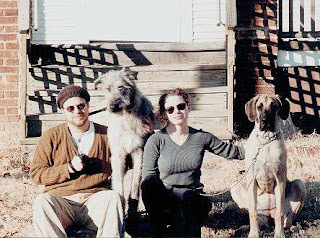 Several months later we got Coesoig, an Irish Wolfhound from a Wolfhound rescue. They were both the same age. 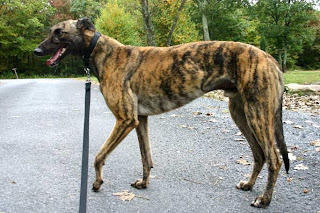 Great Danes and Wolfounds are the 2 largest breeds of dogs. 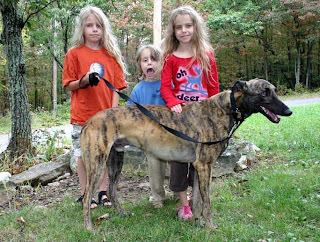 We loved them, but unfortunately large breeds like them are not very long lived. Coesoig died at age 6 and Andromeda was about 8 1/2 . . . she died just a week before Christmas in 06, just a few weeks before Ever was born. We have wanted another dog since then but the time was never quite right. So we finally decided to take the plunge and get a rescue greyhound. 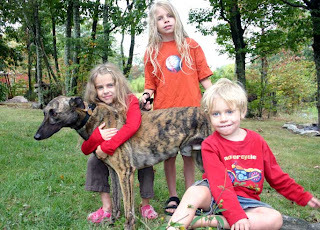 We would love another Dane and Wolfhound (I am the Great Dane gal, Charlie loves the Wolfhounds) and will get them eventually, but there are more Greyhounds needing rescue and seeing as how they are large, but not as large (for reference, Andromeda was 34”, Coesoig was 36” and Ptolemy is only 27-28”) they are clean and shed very little, have fairly low energy, are really laid back and can be good with kids . . . it seemed like the logical choice right now (keeping up with the shedding hair of 2 giant dogs was overwhelming at times!!). He is a sweetie. We saw several dogs but he was obviously the most laid back, the kids didn’t phase him and he wasn’t scared or hyper acting . . . so he was the obvious choice (not to mention he was our favorite color). He is still a bit timid right now, not sure what to make of things. He has spent his life in a crate only going out to potty and run. I am not even sure how much he got to walk in grass (because he seems to think it is really cool). 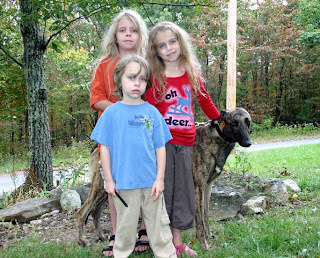 These dogs have never been in houses and often times never seen kids, other animals or other dog breeds. So he was a bit timid going up and down stairs, he wasn’t sure about stuff like the sliding glass doors, and any noise makes him jump and then he will slide around on the wood floors, so sad. He is used to being with other dogs 24/7 so he doesn’t like to be alone at all (even if we are all just in the next room). But slowly he is starting to act like a dog and come out of his shell. He has been coming around us more and he growled and barked at the cats tonight, LOL!! The kids love him. Greyhounds will often bolt at any moving object they see but Ptolemy is pretty good about not doing that so far (I guess he was ready to retire and isn’t anxious to start running again, LOL). Xian likes walking him around outside. Arah follows him around the house constantly. Piper loves on him and likes to brush him and Ever keeps throwing things in his crate and bugging him while he eats (he practically puts his face in the bowl with the dog, though Ptolemy doesn’t care one bit . . . I said he was a good dog!!). I need another blog subscription like I need a hole in my head, but here I am- because your carriers are AMAZING and beautiful and because we have a greyhound too! Our guy is 6 now and has lost a lot of that muscle and put on some weight just like you describe. He is great with our 1 year old and all together an amazing dog. Congratulations on the new addition to your family! Jamie, we love him, he is just perfect for us! I was looking up his race history (last race was in July) and he didn't do too bad, ran about 80+ races that I could find and won like 10 of those. Surprised me a bit because he appears to have absolutely no prey drive (which is a good thing, LOL). Kristi, we were up there today, my 4 and Kim's 4 were running around and he was just standing there watching them (he is so calm didn't chase them at all, though I am not sure he knows how to play with people) and then they would grab his collar and lead him around and he just gladly went wherever they wanted to him go. Nothing they do fazes him and I have never had a dog who is so laid back!! He is great with other dogs too! A magic 'formula' for easier parenting? ?